I had brunch with my best friend over the weekend. It had been a while since I’d seen her, and it made me sooooo happy to catch up. There are a boatload of reasons I couldn’t live without Lish. She’s an amazing person. Although we both live in California these days, we met far, far away in a land called New Jersey. We both come from tiny towns in the same Midwestern state, although our paths didn’t cross until we were knee-deep in all things Jersey – back when we were wild-and-crazy twentysomethings. 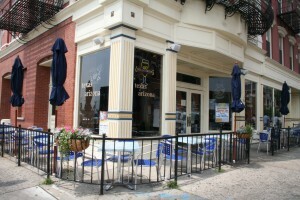 Both thoroughly white-bread and corn-fed at the time, with pale skin that could blind you in winter and (arguably more importantly) not much experience yet in the way of street smarts, we stuck out *just* a tad amongst the been-around-the-block-a-few-times Italian-American brew that is Northeastern NJ. Our specialty was dancing in bars that weren’t actually set up for dancing, as well as harassing DJs until they would play “Sweet Caroline” for us (so good! so good!) and hurling ourselves toward the stage when local cover bands struck our fancy. Since then we’ve taken our show on the road to any state, country, or continent that will let us in. Our passports have taken a nice beating together, and it’s fair to say we’ve gained a fair bit of worldly wisdom (some days this is debatable). One jet-set long-weekend trip took us to Portugal – my recollection includes a very sweaty hike up to the top of a Moorish castle and some guy named Paolo? Marco? Marco Paolo? – but that’s a story for another post. However (here comes the segue) – Portugal is the place that harbors the location that inspired my new knitting project. I’ve had this project in my unofficial queue for a while now, but haven’t Ravelried* it yet because I’m kind of making it up as I go along. I wouldn’t say I’m designing this sweater, really; I’m loosely basing it on a sweater I picked up a few years ago when I was at The End of the World. Ah, yes – good question. Basically, this is a very, very windy place on the edge of a cliff overlooking the Atlantic at the the southwesternmost point in Europe. Back in the day, before their little boats made it over to the Americas, the Europeans considered this the edge of the world: a horizon of churning water stretched as far as the eye could see, beyond which lurked the abyss. Whodathunk there were a bunch of people across the pond, eh, guys? Silly landlubbers. Right. So when you’re at The End of the World, it’s not only a minor tourist attraction with a nice view and a story to go with it, but also an opportunity to freeze your patootie off. Even on a bright, sunshiny mid-summer day like the one of my visit, it was nippy, with wind gusting in every direction. I need to find the photo from that trip to properly illustrate this; the one in which I’m still shooting for glamorous with my pose, but all bets are off with my swirling hair captured with all split-ends pointing north – straight up, Paula. It’s-Not-Really The End of the World was a draw for me as a side trip from the warmer climes of the beach far below mostly because of the “seaworthy sweaters” that my guidebook told me were on offer there. 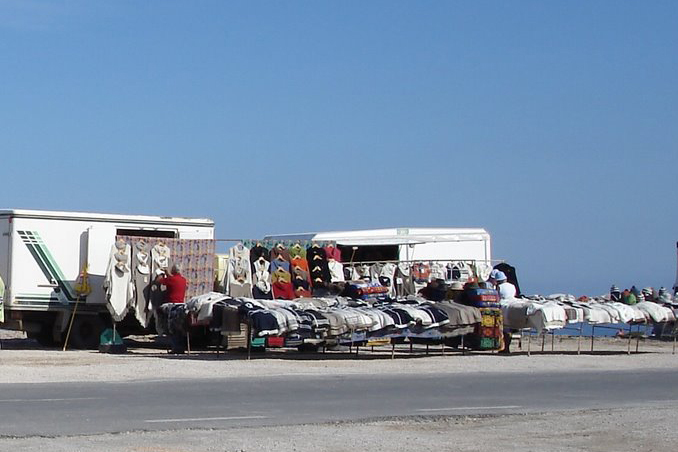 I envisioned a weather-beaten crinkly-looking Captain Ahab, perched next to his ramshackle lean-to of a vendor stall, balancing on the leg that wasn’t his peg-leg, eyeing me suspiciously, ready for me to barter with him for one of his authentic salty-sea-smelling jumpers. Of course, these would be hot off the needles; pleasantly-irregular creations that the missus was whipping up for him back down on the boat in his quarters. Maybe after we shook on the deal for one of his wife’s crafts, he’d mutter “Arrrrrrr” gruffly under his breath as I walked away. In my last glance back at him before forging ahead to the mighty sea, I might even catch him picking at his teeth (what remained of them) with his steel hook of a hand. Ahab turned out to be a Portuguese kid wearing a Yankees T-shirt and outlandishly shiny bling. The missus was nowhere in sight, but I suspect she may have been kicking her feet up after hitting the “go” button on the industrial-grade knitting machine a few hundred times. Even though it was a teensy bit different than I’d imagined, there was still a nice display of sweaters that did indeed look seaworthy. Machine-made with acrylic or not, these little fellas had led me here – I’d come a long way and was going to have a look. Plus I was starting to get pretty cold, and they were looking mighty warm. 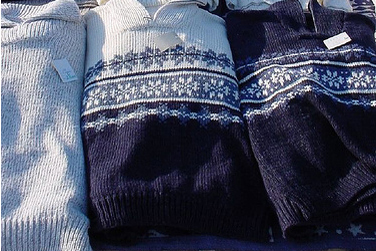 The Fisherman’s Sweaters weren’t incredibly ornate – just very simple Aran-inspired designs, most with a few cables and big cozy collars or turtlenecks; some with cheesy design patterns, some more plain and to the point, which were the ones I liked best. Bulky knits, as you’d imagine, and in an array of earthy tones. True, the cardboard boxes they came out of didn’t foster that handmade feeling, but I still decided I needed to take a sweater home with me (and/or immediately pull it over my wind-whipped mane and shivering blue lips). I chose one in a heathery sandy color with a short zip at the top to keep out the wind, and proceeded to speedwalk out to the edge of the cliff for a gander before scampering back to the safe haven of the car. When I bought this sweater, I wasn’t yet a knitter, and frankly, would have been shocked at the time to learn that I’d ever become one (such was my aversion to anything approaching a domestic art). 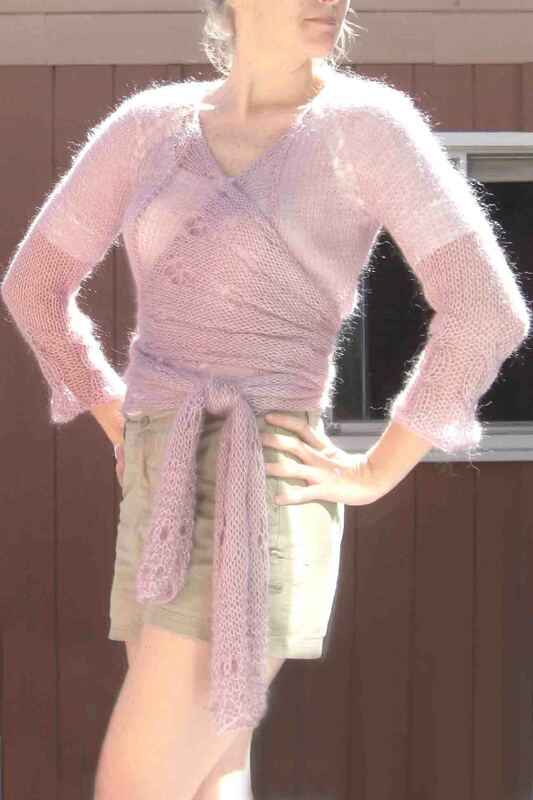 However, since I’ve picked up the needles, it’s crossed my mind that it would be fun to re-make this sweater with a nicer natural fiber and a few modifications to make it just right. I’ve seen a host of patterns out there for something similar, but I’m going to give this a go with making my own measurements and building a pattern based on the gauge of the yarn I choose. 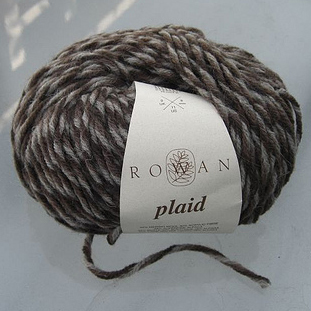 And that yarn is: Rowan Plaid. Poor Rowan Plaid. Why discontinued, why? Not that I’ve made anything from this yarn yet so as to form a strong attachment, but it just seems so well-loved by the knitting community at large. 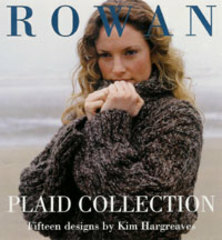 I’ve had a few Ravelrers message me to ask if I’m willing to sell part or all of my Driftwood colorway, but I’ve had this stashed specifically for my Fisherman’s Sweater since the Rowan Plaid pattern book caught my eye with its chilly-seaside photo spread. I grabbed the last of this colorway on sale at Jimmy Beans (after a flirtation with and eventual purchase of Sea Kelp for another project) when they were liquidating the last of their Plaid inventory last year. So sad. The fact that they were getting rid of it, that is – not the fact that I was lucky enough to snag it before it was gone! 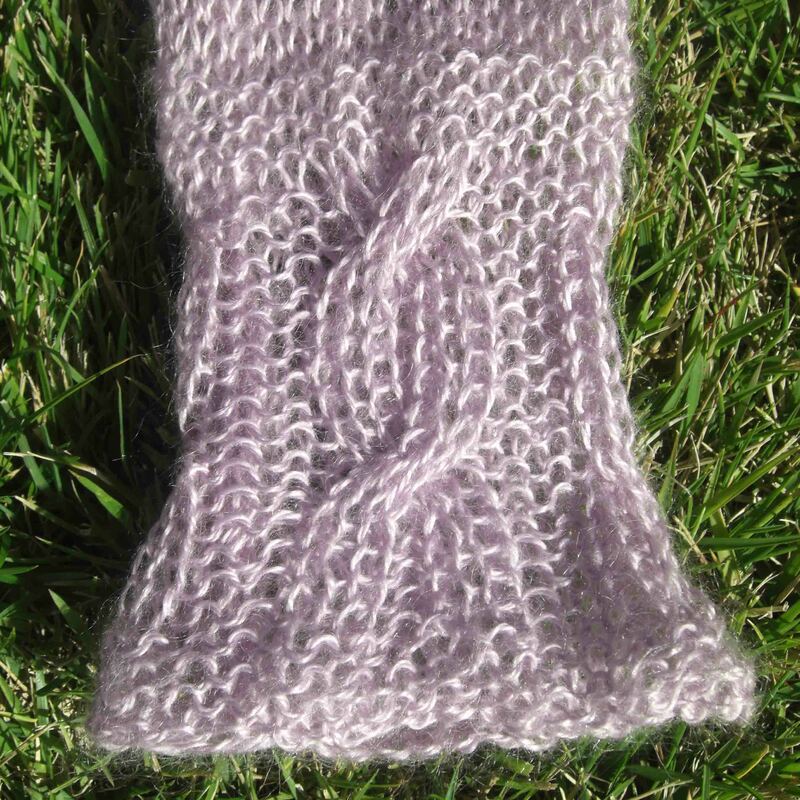 Bottom line – my baby’s now on the needles, and I’m lovin’ it. No good light for a photo of my work yet, but will do this soon. If it turns out as fabulously as I’m planning for it turn out, I’ll post the pattern for anyone who wants to give it a shot. Easier to decide if you’re in this category, of course, after you’ve seen the final product. When I’m finished we’ll decide how the original acrylic prototype – the photo of which I will hold in suspense for now (meaning I haven’t gotten around to taking it yet) – stacks up to my creation. Here’s hoping this moves along without any tears, other fits of drama, or industrial-grade knitting machines. Stay tuned, just in case. Woo-hoo, off the needles! As of two days ago, technically speaking, but I needed to seam and block before my über-high-fashion photo shoot. Blocking didn’t change much in terms of the fit, which overall I’m happy with, but it did even out the stitches a bit. So – I like Airy. She’s easy breezy to look at, yet surprisingly warm – thanks to the mohair – given that it’s a lacy summery top. As for completing the look, I need to find/buy another white camisole or sleeveless tank. Couldn’t find the one I know I have that’s hiding from me, so I went with a scoop tee for these shots. I’m sure I’ll experiment with other undergarments for this, but to show you, I wanted to stick with basic white. As you’ll note from my Ravelry project notes, I used the yarn prescribed by Stefanie – Lane Cervinia Softer – down to the color (I know, I know, very unoriginal thinking, but what can I say – I liked what I saw in the photo). Yarn-wise, the Italian blend gets a thumbs-up: easy to work with, nice drape, nice feel (in spite of the acrylic component). I’ve seen a few knitters question what to substitute if you’re not into sheddy mohair (I say no biggie with such a light color – I just won’t wear black on the bottom). Tough to say, since I’m not an expert on all things lacy, but I wouldn’t be quick to approach a substitution on this one. It seems critical not to end up too heavy on the weight. Also, with a size 11 needle (which I did achieve gauge with as written in the pattern), you don’t want to go too lightweight with the fiber holding together the larger lace stitches – it’s not that they’re that complex, but it’s that you don’t want the fragile-looking stitching to actually become fra-gee′-lay (um, yeah…being a big movie-line-quoter, I almost always think – or say – “fra-GEE-lay” when I write or say “fragile” – I can’t help it. It comes from A Christmas Story, when the dad won a “major prize” and gets all excited about the fantastically still-unknown, full-of-possibilities contents of the large wooden crate marked “FRAGILE” that arrives on his doorstep: “Look at that, it says fra-GEE-lay…must be Italian!”). Anyhoo, back to Airy. In the way of putting this puppy on and actually wearing it (I know it’s not really difficult – just wrap the ties around and then – you guessed it – tie them), there are a few things you might want to think about in advance. As I’ve already mentioned, I doubt you’ll want to make the ties as long as they are written to be in the pattern. Luckily my waist circumference must be in the same ballpark as others who’ve come before me who have made this suggestion. I stopped at 42″ on the first flap until I caught up the other flap to the same length, then ultimately found that I needed another 2″ or so (another 6 rows of stockinette following the lace stitch where I stopped), given that the decrease rows that form the pretty detail on the end of the ties would add probably another 6 inches. You should think about how tight you’re going to wrap yourself up when you’re actually wearing it – and who among us wouldn’t be tempted to crank those ties pretty darn tight to cover up the bulge from that HUGE Mediterranean platter we devoured at lunch? Also consider that the ties will stretch a bit more once you’ve pulled them taut (even after blocking) – and thank goodness for that, since we’re not going to be able to keep it up with that corset-like attempt we made up above there to hold in the gut. Even in tying and re-tying the knot to get it to look right (yes, I too was shocked when I didn’t get it picture-perfect the first time), the ties took on another inch or so as the fibers settled into their designated places in the wrap. In a nutshell, proceed with caution unless you want to swear while ripping back inches of knitting. You should be prepared to lose at least 6″ off the ties as written. it fun to know it’s there? The tie-wraps are hard to visualize until you’ve actually knitted them (or seen more detailed photos than the pattern book provides – like, say, these photos here!). The dimensions diagram in the book doesn’t show the flaps, but they are in fact long extensions of the right and left front. When I first read the pattern it seemed like they should be narrowing sooner than they do in order to actually become “ties”, but it ends up making sense – ultimately they curl in lengthwise toward the end of the flap, which makes them look skinnier. Around the back it’s nice to have substantial flaps to wrap around so that the cabled bottom edge is nicely tucked under and less likely to end up unevenly hanging out below (or even partially above) the wrap-around part. I actually tucked in the bottom edge of the back cable when I was wearing it so that it was nice and smooth across the whole back. Others on the Fitted Knits KAL on Ravelry made other modifications or wore the ties slightly differently so that the cabling detail is more visible; some didn’t bother doing the cable detail on the back at all. Different strokes. The only modification I made other than to shorten the oft-mentioned ties was to lengthen the torso and sleeves (extra 2 inches each). The added length in the torso required picking up another 4 stitches at the start each front flap. 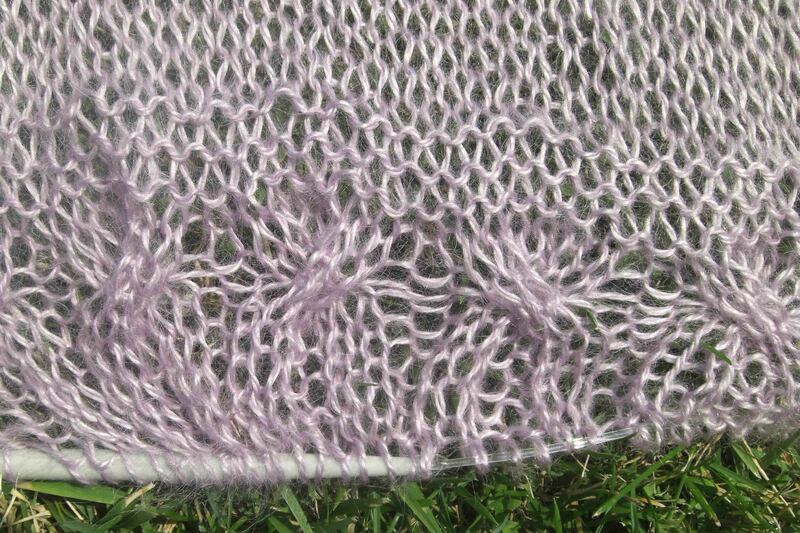 I added 2 stitches to each end of the row throughout the knitting of the flaps; if I’d thought about it more I may have added the 4 stitches evenly in-between the lace stitches…but you know what? It wouldn’t have made a difference. Those little flappies start to roll up at the edges (by design) and the lacy yarn-overs just blend into the over ambience of the ties. The extra four stitches meant I needed to add four more decrease rows at the tie-ends in order to land on the 21 stitches at bind-off; I divided the extra decreases evenly and did 2 in each set of the garter stitch repeat before the row of yarn-overs. Easy peasy. Even though I did try this on all along the way and it seemed the extra inches were needed (as I would usually expect), in the end I don’t think I needed to add any length. The sleeves hit me a little lower than they do on the model in Fitted Knits, but so it goes. Seaming the sleeves took about 2 minutes – very easy. I saw someone dreading it on a Ravelry forum (“What? Stefanie’s making me seam something?”) – but this tiny little lightweight, big-stitch inseam is about as simple as it gets where stitching seams is concerned. Thanks to Sissy B for the hand-me-up pair of khaki shorts for my rear-shot on the right. I’ve been frightened of shorts for several years now – I like to say it’s because I’ve refined my sense of style: “Europeans don’t wear shorts, you know” – but mostly it’s because I’ve become frightened of my thighs. My sis gifted these during her recent visit (and if I’m not mistaken, they were gifted to her at some point a while ago by Wee C, our youngest sis); she’s moved on to another style, so she shared the love. These have been all the way up the sister food chain, and will now be gracing my booty, as long as I can rev up the courage to wear them. Let’s face it: in California people would wear these to work – say it with me, oy – so although I will never ever bend on that one, I could probably give them a spin in public. I mean come on, the people at the grocery can handle these tree trunks. 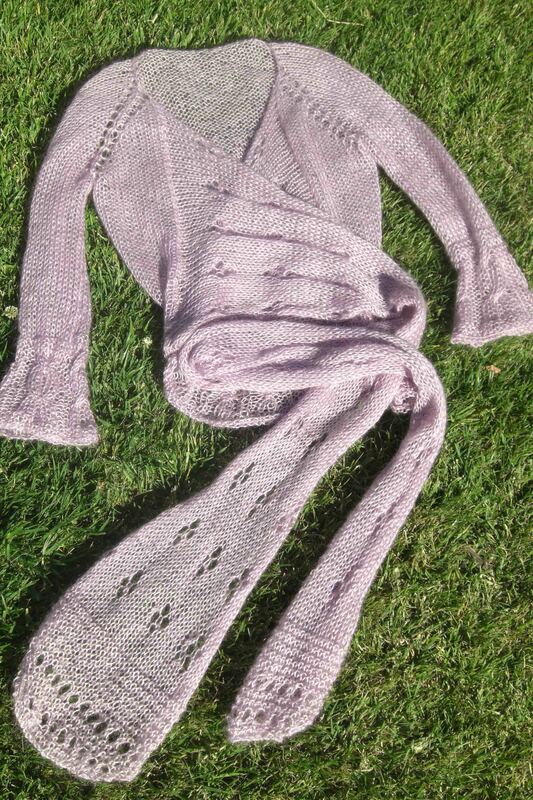 My Airy Wrap will take my mind off my upper-leg-paranoia – I’ll glide along feeling fabulous in mohair, just as I’d imagined the day I cast this on. I’m super close to being done with my Airy Wrap-Around Sweater. It’s getting very big and fluffy as the second wrap-around flap is rounding the bend. I stopped shy of the 55″ recommended length for the right flap, pulling back the reins at about 42″ and running scrap yarn through to hold that length while I bring the left one up to speed. My homies on the Fitted Knits KAL (Knit-ALong) on Ravelry as well as those on this one running independently had noted that the ties ended up being way too long for most of them as written, so I’ll be prepared for the modification. Lordy, I hope they’re headed toward being way too long for me as written, too, or else me and my thick waist will have to go into hiding with Ben & Jerry for a while to wallow in our excessive girth. The dimensions are a little off as I model it here – without the sleeves seamed and both sides of the wrap done it’s hard to get it to sit just right – but you get the idea. Blocking this puppy is going to be very interesting – the combo of sticky wet mohair and lace stitching will be a new one for me. If anything it’s a bit roomy for my taste at the moment, so we’ll see how we go in getting it to hug me just right (and avoid any accentuation of the aforementioned possbily thick-looking waist in the process). Looks like I’ve got a few craftless hours ahead of me, but I guess it isn’t all fun and games. However – I’ve still got some time left with you here on my blog, so I’m going to roll around in it and enjoy while I can. Dancing with Sissy B – The abundant joy already inherent with a nearly 2-week visit from Sissy B and her wee girls was ceremoniously trumped with a mid-week 80s night at a bar up the street. We arrived glammed up and ready to go, ordered up our little drinkies and proceeded to wait – the DJ was late, and wherever he was, he had our tunes with him. We were getting a bit nervous that our soujourn’s wings had been clipped. Alas, he eventually showed up – but we were none too pleased with the weak effort of his debut, starting with mixes of lesser-known not-so-crowd-pleasing minor 80s hits that just weren’t cutting the mustard. 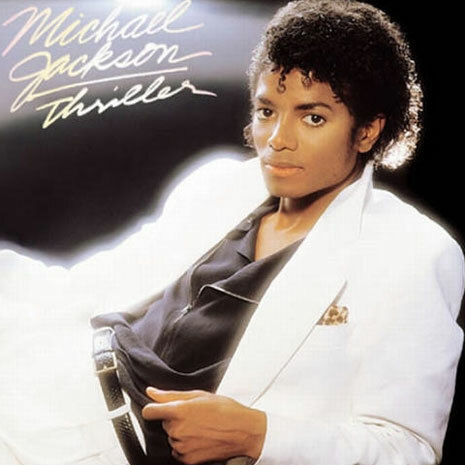 Just as the mutinous crowd (read: my sister and me) was on the brink of highjacking Master Mix’s booth, he came through with “PYT” – and continued with a steady stream of sister-approved, shout-out-the-lyrics, jump-up-and-down old standbys. Much hilarity ensued, with squeals of utter delight and DJ-directed declarations of, “I love it! I LOVE it!” and “Yes! YES!”. Even though we initially cocked our eyebrows at his unorthodox mixes toward the end – Fergie and Metallica? – we had to admit he had a pretty cool sound going. Bon Jovi took us over the edge with “Livin’ On A Prayer”, and we left with our voices hoarse and perma-smiles plastered on our faces. We still got it, baby. 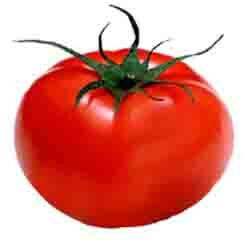 Organic produce – OK, I’m still a relative newbie to all this business of “social awareness” and “healthy lifestyles” (think Chris Farley as the finger-quote guy on SNL’s Weekend Update), but I am getting a big-time eye opener lately. It only took 34 years. California has definitely gotten her hooks into me, as impervious as I was initially to her Mother Earth wiles. I had no interest in even recycling when I moved here 5 years ago, and now I’m practically an evangelist of environmentalism and healthy living. The story of how all this happened to the most reluctant of Midwestern girls I will save for another time. Suffice it to say – on the food front, I’m a new woman (now that I’ve put down the Cool Whip – oh, sweet, gorgeous Cool Whip – and taken a look around). I’m in love with farmer’s markets and everything in them. Love the vendors, love the customers, love the samples, love the smiles. Love the prices, too – I’ve come round to seeing why it’s worth all the crunchy hype. I was never willing to spend a dime more on something organic – not only because I’m tight with my money at the grocery store in general, but also because I persisted in using the old adage, “Listen, there’s nothing wrong with chemicals – look at all the non-organic food I ate growing up, my mother too, and look how I turned out!” To make matters worse, I studied chemical engineering, so I’ve gone around trumpeting the praises of using whatever modern means we have available to get things to be cheaper or lower in fat, sugar-free. But – without anyone shoving this down my throat, which would have been a sure-fire way for me to be even more impermeable – I’ve seen the light. First, I began to scrutinize (in following my sister’s lead) what kind of food was allowed to pass my nieces’ lips, not only in terms of nutritional value, but in terms of what was actually safest for them. Even if I wasn’t sold on the “benefits” of organic food at all, latent doubt did give me pause enough to agree that organic baby foods would be better for the girls – “just in case”. It took another year or two for this logic to seep further into my brain to its natural conclusion that I – yes, me myself – might want to think a little more about the origin of what I put in my body, chew up, and swallow. No matter what I’ve eaten over the course of my first 30 years, why oh why would I put anything into my body that has even trace amounts of something I wouldn’t spoon in there on purpose? Nagging suspicions began to accumulate, and finally I let myself actually read and absorb different viewpoints so that I could form my own objective opinion. Nowadays I don’t need something to be proven a carcinogen to be wary of it. If it needs help to grow out of the ground when 50 or 100 years ago it did so without any help, doesn’t it make you wonder? Why douse it with something toxic? It’s cheaper, you say, to grow food this way – ah, but we’re still paying for it, more so every day – just not at the grocery. A lot of other people are making money off of moving truckloads of little veggies and fruits around (ask yourself why the U.S. exports 1.1 million pounds of potatoes annually and also imports 1.4 million pounds every year…hmmmmmm). Although I’m determined to NOT to beat anyone over the head with this, I can’t help but list the discovery of all things organic on my list here, because it just is something I’ve very grateful for. More later on what I’m learning, because I won’t be able to help myself – but in the mean time, if you’re curious – check out Barbara Kingsolver’s Animal, Vegetable, Miracle. She’s not shoving anything down anyone’s throat either, which is why I became enamored with her friendly, engaging, fact-based writing style. Her husband and teenage daughter (now studying nutrition at Duke) also contribute and the collective effort makes this a surprising page-turner. Oh, my knitting, of course – in a world full of stressors (does anyone else feel like their days can turn into a “Space Invaders”-esque challenge where nothing can be allowed to pass by you unaddressed, or else the whole world will blow up? ), my humble stitch-laden needles are such a solace. Cute little furry things they are right now, with lavender mohair all over them, surrounded by Airy’s billowy-ness. Just a few minutes is all it takes and to start bringing my focus on all things calm and rational back into line. More than a few minutes is always better, you understand – that’s why I surreptitiously slide as much time with my needle-friends each day as I can. That and I’m a junkie – I’ve got an addictive habit to support here. Speaking of a few minutes, I’ve dilly-dallied more than a few with the indulgent rants of my blogging, and now I must…I must…I must increase my bust…(Oh Margaret, where are you now?). I mean, ahem – I must, I must, I must go do my housework. Why is it July already? Not that there’s anything wrong with July – it’s all just happened so fast. My sister and her girls are with me this week and I couldn’t be happier. It’s heaven to be with them so I’ve taken time off to bask in it. My almost-three niece wants me to make her a sweater, so I’ve got toddler patterns on the brain. She is waffling between “something purple” and “something red”, and “maybe…something…with short sleeves”. Makes sense since it’s a touch warm outside, and who wants to be all bundled up for summer? I picked up Adorable Knits for Tots by Zoë Mellor, without much research other than a quick leaf-through at Michael’s while we were picking up craft projects for the kids. Jennifer at http://loopyknitter.wordpress.com pointed me in the right direction to find the errata (which DebbieKnitter went through quite a bit to find) – just in case I end up making something from this book. 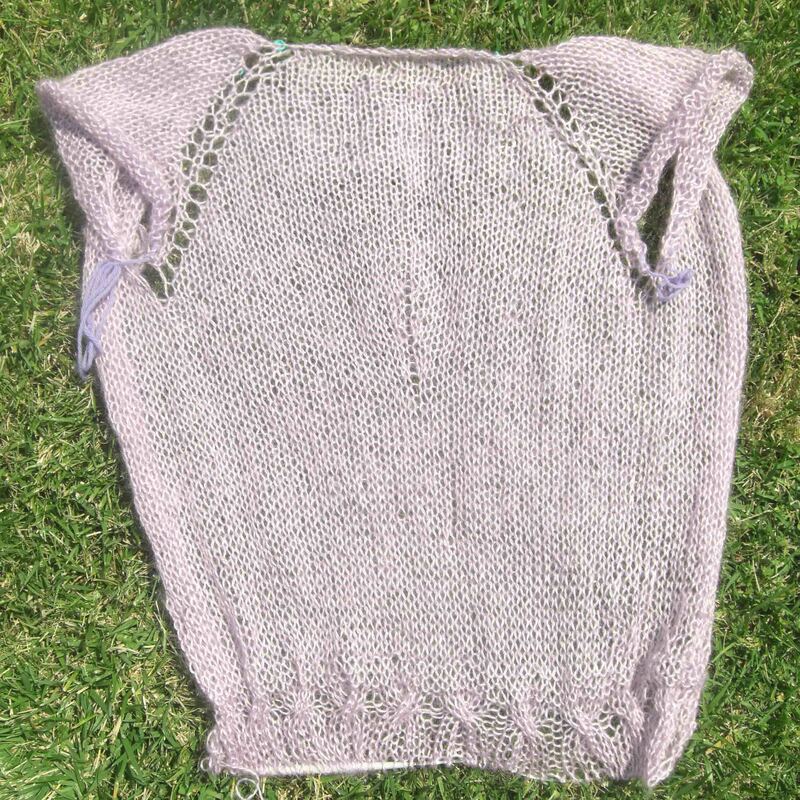 My niece’s request for purple may be inspired by my continued sneaky attempts to work on my Airy Wrap-Around Sweater from Stefanie Japel’s Fitted Knits. It’s coming along – it would be faster if I could tear myself away from the aforementioned toddler pattern search in the time I have free during nap time. 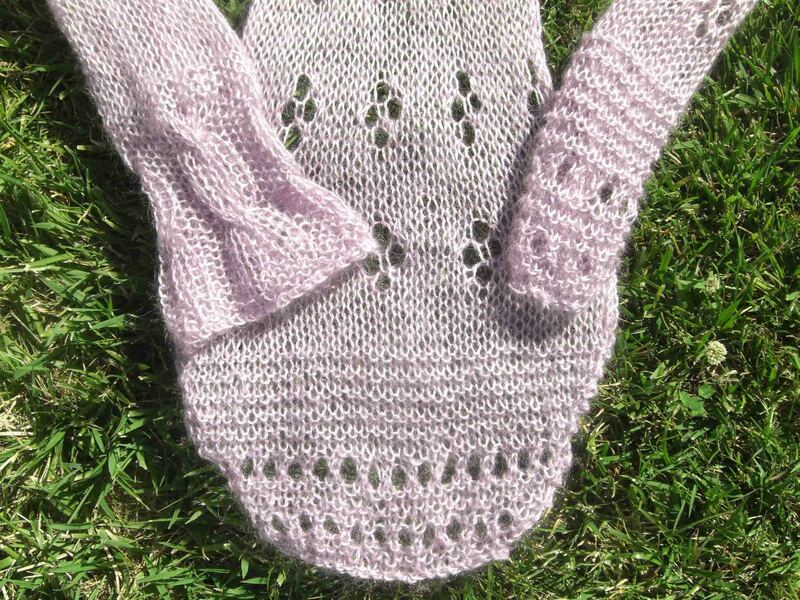 I like it – the floatiness of the lacy stitching is still a novel drapey feel for me while I’m knitting, so it’s fun. Just about done with the back so I can move on to the sleeves, which I’m thinking about making a bit longer than 3/4 length per the pattern. I lengthened the torso of the back by a couple of inches; instead of doing only 16 rows of stockinette repeat before starting the cabling, I added an extra 8 rows. 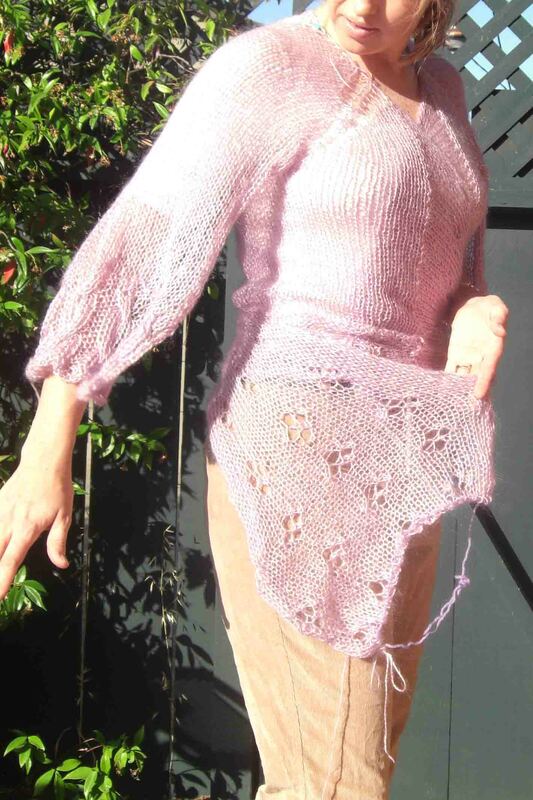 One of the other patterns I found on Ravelry last week that I’ve been dreaming about since is the Sheer Poncho by Amy Arifin, who has kindly included this beautiful pattern in the free designs section of her cool website. 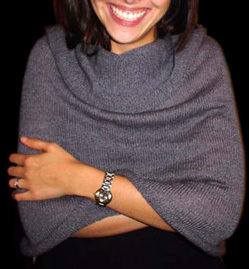 I was searching for cowl neck patterns (I developed a hankering for one after seeing a funky pink-striped sweater on Alicia Keys in her “Teenage Love Affair” video…I know, how did I stumble into hip? An MTV indulgence is rare but it does happen!) and spotted a photo of Amy’s poncho. Then I saw the alternative ways to wear it and became enamored with the fabulousness. What fun! This one is headed for my queue. I hear the stirrings of my youngest niece emerging from nap time…auntie to the rescue. Back soon!